﻿One Mission . 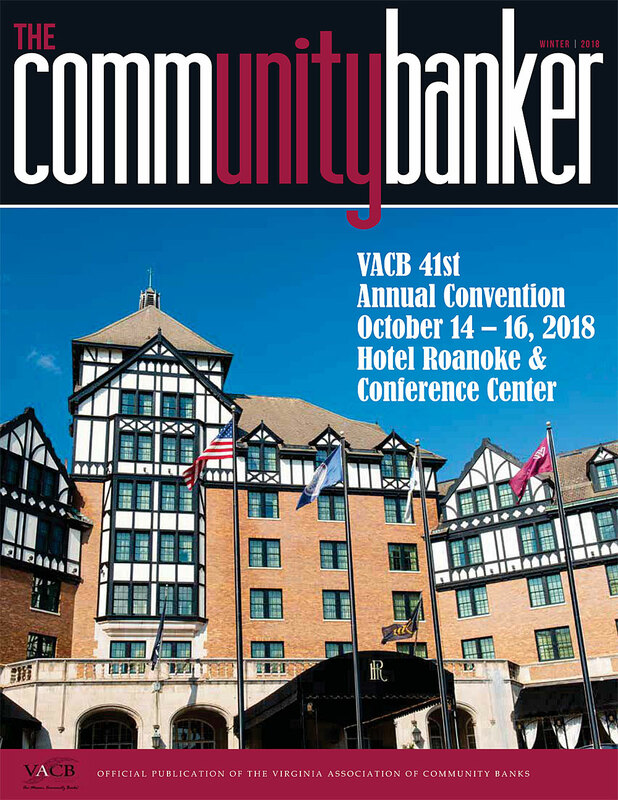 . .
​Join VACB Leadership Bankers, VACB members and ICBA along with hundreds of your fellow community bankers April 28-May 1 in Washington, D.C., to hear directly from leading policy makers and push for positive policy change on Capitol Hill. The ICBA Capital Summit is the best way for community bankers to meet with their lawmakers and press issues including Bank Secrecy Act modernization, the evolving competitive landscape with fintech companies, undue tax advantages of credit unions and Farm Credit System lenders, the need for data breach legislation and more! The Virginia Association of Community Banks (VACB) is pleased to present our Spring Internal Audit Institute. We are partnering with Dixon Hughes Goodman LLC and Yount Hyde & Barbour for this year's spring program. We will spend the first day layering good audit processes from reviewing the risk assessment process to managing the process, to protecting the bank from fraud and reviewing advanced audit tools on the horizon. Day two will take a deep dive into the evolving landscape of cyber security and interest rate risk management. We will finish our ten hours of training with a compliance audit overview which will cover the compliance risk assessment and how the assessment flows to the enterprise-side risk assessment and a review of the components of a compliance risk assessment. To learn more about the program and to register, click the photo on the left. Dean joined F&M Bank as Vice President of Loans in 1993 and worked his way through the ranks to become F&M Bank’s President and CEO in 2004. During his tenure, he has led F&M through tremendous growth and success. At Dean’s helm, F&M Bank has more than doubled its asset size, from approximately $350 million to a current value of $770 million. ​Dean takes pride in seeing the potential in his staff and positioning them for success. Dean is well known at F&M Bank for being approachable, a good listener, and a champion of encouragement for personal and professional growth, as well as the impetus for active community involvement for which F&M Bank employees have come to be known. Carolyn Kline is Vice President and Chief of Retail Operations of Virginia Partners Bank in Fredericksburg, VA. Ms. Kline received her undergraduate degree in Business Administration from the University of Mary Washington and continued at her alma mater to obtain her Master of Business Administration (MBA) with a concentration in Human Resources earlier this year. She is a graduate of William Monroe High School in Stanardsville, VA. She is considered a Key Volunteer for the Marine Corps Marathon and has volunteered over 500 hours with them since 2013 throughout various races in Virginia and DC. Prior to beginning her career in banking, Ms. Kline worked as a Manager of Chick-fil-A for 5 years.